Sen. Lou Ann Linehan introduces a new bill Jan. 17. LB1082, sponsored by Omaha Sen. Tony Vargas, which would require jails, law enforcement agencies and the Nebraska State Patrol to provide public notice before entering into agreements to enforce federal immigration law and to allow audits of noncomplying entities. A complete list of introduced bills is available at NebraskaLegislature.gov. New bills may be introduced for the first 10 legislative days, or until Jan. 18. 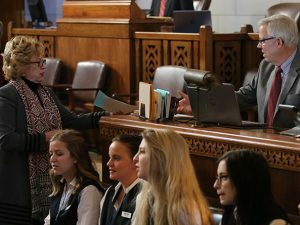 Nebraska Supreme Court Chief Justice Michael Heavican will give the State of the Judiciary address on Jan. 18. The session will last 60 legislative days and tentatively is scheduled to adjourn April 18.